Upon receipt, bring your butcher block countertop into the area where it will be installed. It's important to give the butcher block time to acclimate to the conditions in your house. 5 days is adequate for the wood's acclimation process. A. 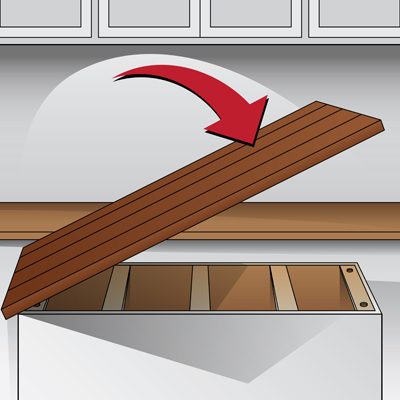 If your cabinets have open tops: Install blocking if your cabinets have open tops. This is to create a surface that you can attach your butcher block countertop to. Use a quality grade of 3/4" plywood or 1x stock boards to do this. 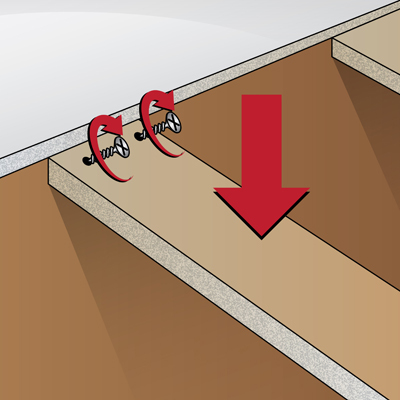 Install the blocking flush with your cabinet tops by first drilling pilot holes at an angle through the blocking and then screwing the blocking to your cabinets. IMPORTANT: Make sure to use properly sized screws so that you don't screw all the way through to the outside of your cabinet. B. If your cabinets have closed tops: Install furring strips. Use 1/4" plywood and cut these strips 2" shorter than the cabinet depth. Repeat every 12"-16". You can install these strips with kitchen and bath sealant. This provides a little air space and prevents cupping over time in humid environments or in environments with varied climates. IMPORTANT: Butcher Blocks need room to breathe. Although you won't see it happening, they will expand and contract based on climate, humidity, and temperature. It is important to follow this step exactly. Do this before you place your countertop on the cabinet. DO NOT apply this step to the butcher block itself, only apply this step to the bracing you've installed in the previous step. 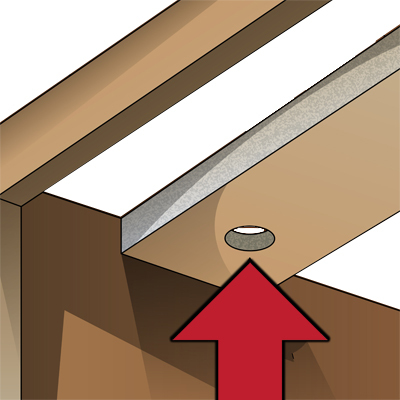 Use a 1/2" boring bit to drill holes through your cabinet bracing. Drill these holes at all planned installation points. Position your butcher block as it will be installed. From underneath, find the canter of each hole you drilled with the boring bit. 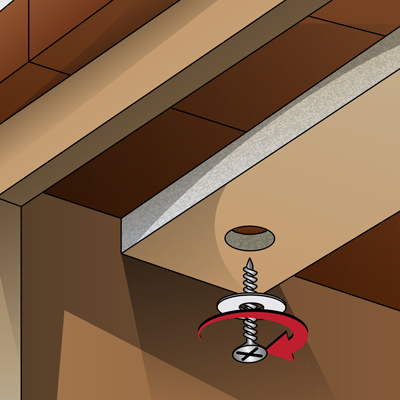 Pre-drill into the butcher block using a drill bit adequately sized for your screws, making sure to mark your depth so as not to drill all the way through your butcher block. You're just about ready. 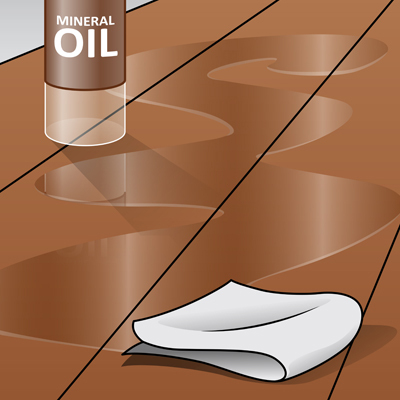 Thoroughly saturate your butcher block with food grade mineral oil aka Butcher Block Oil. Let it soak in and apply more if necessary. This is a great time to use our Butcher Block Conditioner with Organic Beeswax, which works as a food safe sealing coat and keeps your Mineral Oil finish in longer. Check your Butcher Block regularly for dryness and keep Butcher Block Oil on hand. Apply when needed; there's no such thing as too much oil for a butcher block. Need will vary based on climate, but every 2-4 weeks is a reasonable timeframe (more often initially). Remember to oil the bottom, too. Keeping the bottom oiled is important for the health of the butcher block. Oil won't evaporate as quickly from the bottom as it will from the exposed top, but it is important to remember. With open-top cabinets, you can simply put oil on a rag and wipe the bottom from inside your cabinet. With closed-top cabinets, you'll remove installation screws/washers and lift up the butcher block to oil and condition it from time to time.